Best Location on Beach: Enormous Lux Villa: Amazing Views & Most 5-Star Reviews! Best Location in Lagos: 5 minutes walk to the beach, marina and old-town. Enormous air-conditioned town-house with spectacular private terraces overlooking 5 miles of unspoilt beach at Meia Praia in historic Lagos. Walking distance to all amenities including the pool, beach, marina and old town. Its the perfect spot for a relaxing week or two in the sun. Super fireplace with firewood supplied for winter evenings. Check out our reviews - most people give us 5-star ratings for Location, Value and Quality. Villa is finished to the highest standard with air-conditioning, TV & DVD, BBQ and all the space you need to relax with friends, host a dinner party or just spend some quiet time with the family. We even have a table-tennis table for the kids! There is plenty of parking outside and a private car-port. The Master bedroom and living rooms have private balconies and spectacular sea-views and luxury bathrooms with hotel-quality towels and linen. Ground Floor: Garage with Table Tennis, Double Bedroom with private terrace and en-suite bathroom. First Floor: Large modern kitchen and dining room, Large Family room with working Fireplace and Large Balcony with panoramic sea and town views. Private Roof Terrace: Large terrace with sun loungers and panoramic views of town and beach. Sun trap from dawn til dusk. The great attraction is not just the chic design or the ample space...the clincher for most people is the beach at Meia Praia! 5 miles of perfect, soft sand with a gentle slope into the ocean. That's where most people spend their days and evenings...the perfect setting for the perfect holiday. Boa Vista is a 5 minute drive. 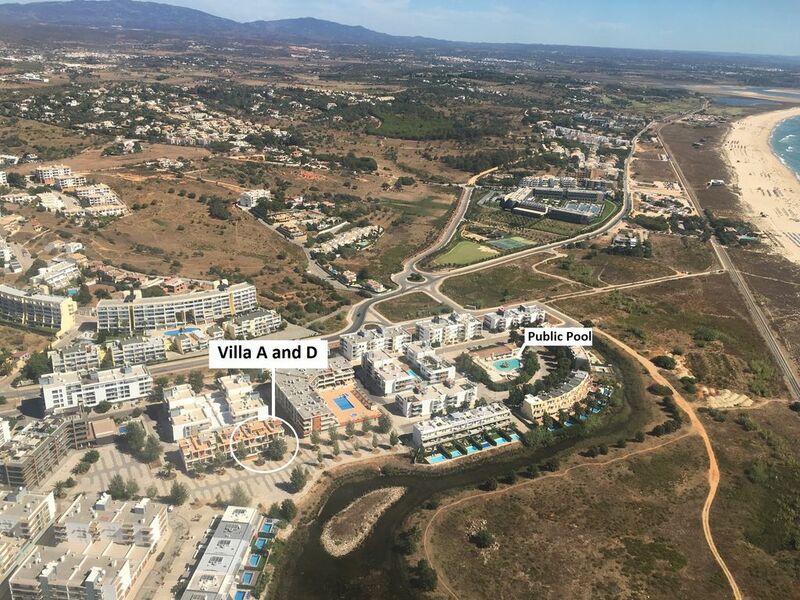 The courses at Villamoura are a 30 minute drive. The courses at Quinta de Lago are a 40 minute drive...there's lots to do for the non-golfer too. You are a short drive from water parks, horse riding, sailing, micro lighting and water sports too. Beach activities: The properties are moments walk from Meia Praia with its 5 miles of soft sandy beach. Set back from the gently sloping sands are several beach bars and cafes....the more adventurous can try their hand at kite-surfing, canoeing, take a dingy-sailing course or even try parascending....many people prefer to just sit and enjoy the beautiful surrounds..with the occasional dip to cool off! Available as an extra charge of Eur 100 per week. This covers the cleaning and maintenance of the Jacuzzi. Absolutely no smoking - this is an insurance issue. Great apartment, finished to a very high standard, ample space for 6 adults and 4 kids. Short walk to marina, beach and town. Great dinner/entertaining facilities. Will definitely be back! We could not imagine a better location...a short walk to the beach, the marina and town. The property itself was updated and clean, with great sleeping arrangements and bathrooms (4 of them) for 8 adults. Our host, Paul, gave us some superb eating recommendations and was very responsive. We had a fantastic vacation. Thank you Paul! Just spent 4 nights in this beautiful spacious villa with 6 friends. 10 min walk to beach, the Bahia beach bar is well worth a visit. 5 minutes to marina with loads of restaurants and bars. The villa itself is very well equipped like being at home. It had everything you wanted and more. Would definitely recommend it to friends and would definitely return. Lagos is a beautiful town with a good variety of bars and restaurants. The beach is amazing. We had a wonderful week in Lagos staying at this property. It is absolutely huge and as other reviewers have commented, the photos don't do it justice. Every bedroom was spacious with a wonderfully comfortable bed, loads of storage and modern bathrooms. The kitchen was well equipped and all the different balconies and terraces made the best of the outdoor space. Location wise it couldn't have been better with just a short walk into the marina and town beyond, as well as the beach of course. The location was perfect, 10 minutes to the beach or 10 minutes into town. The villa was huge and fully equipped. We paid extra for the jacuzzi and it was totally worth it. The view from the roof terrace was sublime. Only thing we missed was a pool as unfortunately the pool a couple of blocks up was shut 😩 But we used the one on Meia Praia which was great and only 5€ each because it was out of season. Lagos is a wonderful place and this villa is an ideal location to enjoy it. The Villa is very well equipped and in a great location. The beach, supermarket and pool are all short walks - maybe 5-10 minutes. We rented a car for the week but had no real reason to use it more than once or twice. The house is very large - much bigger than we expected and was very clean and well appointed. The booking process was easy. We love Lagos and have stayed there many times. There are a host of restaurants and coffee shops within easy reach. We will definitely stay here again and would recommend the house to anyone looking for an upmarket house in walkable distance of the beach, supermarket and old town. A beautiful beach, miles long, silky sand and safe swimming. Location, Location, Location! Luxury family or golfing holiday right on the beach, a busy marina with sailing, canoeing, water skiing and within easy reach of the water parks. The historical old-town of Lagos and its surrounds are the perfect location for a family getaway or a fun-filled break. Relax on Meia Praia's 5 kilometres of soft sandy beach, play volleyball outside Bahia beach-bar or snooze the day away under the sunshades by the lifeguard station. You can always be busy doing something....or doing nothing! A holiday in Lagos has it all. Families return for the care-free lifestyle, the gently sloping beach and the paddling pool (for the apartment users only). The gentle breeze means it doesn't get too hot and keeps the mosquitoes at bay. Air-conditioning throughout means nobody gets too hot. After a day on the beach, sailing or playing golf, enjoy a jacuzzi or power shower before strolling into town or to the marina for some of Portugal's famous Algarvian food. Security deposit is paid to Villa Manager. Pro-rata the weekly rate for longer stays.